Welcome to LSK Enterprises Inc.
LSK Enterprises Inc. is the exclusive Olympia® and IceBear® Ice Resurfacer Dealer for the Eastern United States, Hawaii and Alaska. Our Service Department has the only Factory Trained and Certified Ice Resurfacer Technicians in our territory. The OLYMPIA Millennium E battery powered ice resurfacer saves you both time and money. It is driven by four AC electric wheel motors. Its operating expenses are one tenth the cost of a standard propane or natural gas ice resurfacer. When compared to competitors, Millennium-E gets over twice the number of ice resurfacings per charge using the same amount of charging time and energy cost. Designed with ease of operation in mind, the OLYMPIA ICEBEAR battery powered ice resurfacer saves you both time and money. Its simplified operational controls are conveniently located within reach, allowing the operator to make precise blade adjustments during the cut. The OLYMPIA Mini E is the ideal solution for resurfacing smaller rink facilities without sacrificing power and performance. It offers both clean and clean ice while remaining economical and compact. OLYMPIA Millennium H is leading the world in innovative and dynamic ice-resurfacing technology where performance, sleek operation and precision ice resurfacing sets the new industry standard. The replacement of the mechanical drive system with the Bosch Rexroth hydrostatic system has streamlined its maintenance, operation and performance profiles. The OLYMPIA 250 delivers excellent ice resurfacing for smaller rinks that rivals the quality associated with the larger ice-resurfacing system. Designed for and mounted on a Kubota tractor, the OLYMPIA 250 allows a single person to scrape, clean and resurface the ice within minutes. Turn that outdoor rink into a championship ice surface with the easy-to-use, fast, efficient, tractor-mounted OLYMPIA 500 ice resurfacer from Resurfice Corp. The OLYMPIA 500’s twin snow bins allow easy access for off-loading the snow following the resurfacing operation. Ease of use, safety, durability and efficiency are standard features on OLYMPIA Battery Edger. Featuring the latest innovations in design, the OLYMPIA Battery Edger sets a new standard for the industry. From the centralized controls in the handle to the proven reliability of its engine and cutting mechanism, OLYMPIA Battery Edger’s meet all your ice edging needs. Ease of use, safety, durability and efficiency are standard features on OLYMPIA Gas Edger. Featuring the latest innovations in design, the OLYMPIA Gas Edger sets a new standard for the industry. From the centralized controls in the handle to the proven reliability of its engine and cutting mechanism, OLYMPIA Gas Edger’s meet all your ice edging needs. Now you can produce perfectly level ice every time you resurface and get dramatic energy savings with the OLYMPIA LVR Laser Leveling System. A proven leader since it's inception in 2000. The Olympia® Millennium Propane is simple to use, simple to maintain and is simply the best propane powered ice resurfacer in the world. From the automatic snow breaker to the automatic towel lift, operating an ice resurfacer has never been easier. Designed with ease of operation in mind the Olympia® Millennium Propane simplified operational controls are conveniently located within reach, allowing the operator to make precise blade adjustments during the cut. Turn that outdoor rink into a championship ice surface with the easy to use, fast, efficient, Kubota tractor mounted Olympia 250 ice resurfacer from Resurfice Corp. Specially designed for use in the 2010 Vancouver Olympics. This unique ECO design incorporated a battery powered drive train with 4 independent drive wheel motors and an optional full stainless steel chassis & snow bin. Delivering 30 plus resurfacings on a single charge. The first 17 were officially used at the 2010 Vancouver Olympics with another 10 to be used at the 2014 Sochi Olympics. The Olympia ICEBEAR® Battery Ice Resurfacer has been a proven leader since it's inception in the European market in 1984. 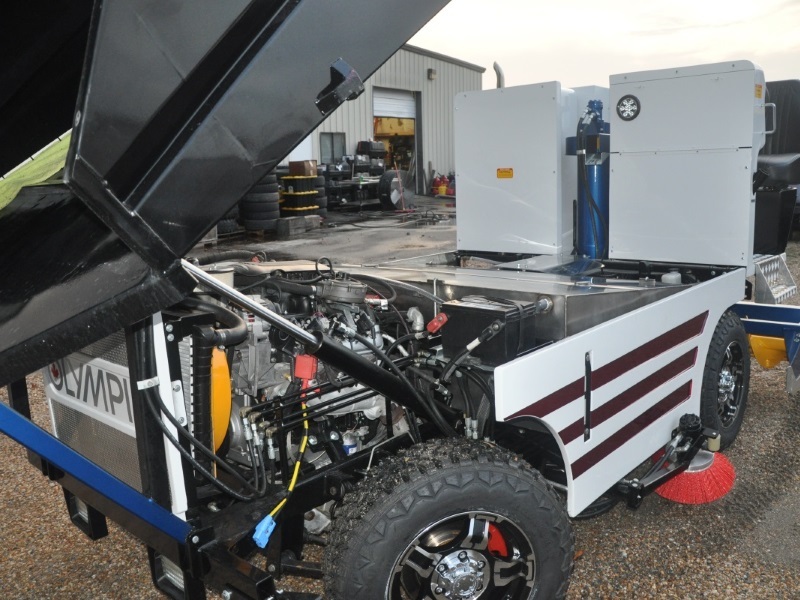 In late 2004 Olympia purchased the IceBear line of ice resurfacers and performed a complete redesign using the best technologies that both companies had to offer. Leasing has become a major source of financing in today's competitive market. Approximately 80% of all U.S. firms currently lease equipment, and leasing now accounts for one-third of externally-financed equipment. American companies today use leasing as a practical and cost-effective method of acquiring equipment needed to run their business operations. With leasing, managers can maximize productivity and profits through the effective use of assets. 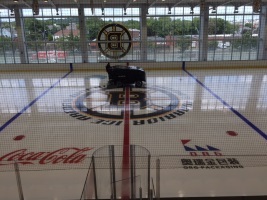 As the Official Dealer for Resurfice Corporation, manufacturers of the Olympia® Ice Resurfacer product line. Our Service Department has the only Factory Trained and Certified Ice Resurfacer Technicians in our territory. Our technicians provide all warranty work within this territory. As the dealer we also provide Preventive Maintenance Programs and onsite emission testing. Current customers please take advantage of our customer online registration process. This area has been designed to help customer meet their specific needs, with items such as Manuals, shopping for parts, and watch training and technical videos from your computer or mobile devices. Please click on the Parts Reg link. Rebuilding of Olympia Ice Resurfacers is our specialty. On every build, we strive for a finished result that exceed our customer’s expectations. We are known for our quality of workmanship while providing our customers with the best product possible at a reasonable price. RINK Magazine is the official publication of Serving The American Rinks (STAR).